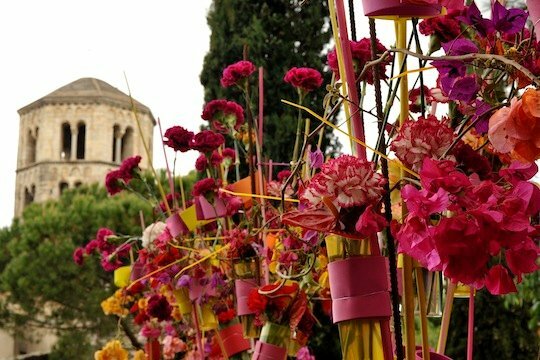 Girona gets decked out with flowers for Temps de Flors. 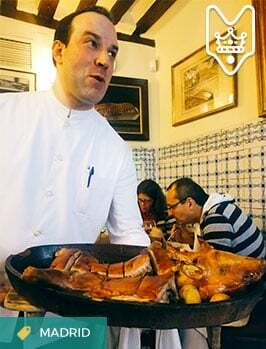 Spain is a country of festivals, from the Southern Spanish sherry fairs, to strange food fights and even wine battles. But one of the most beautiful Spanish festivals is surely Temps de Flors, a springtime flower festival in quaint Girona, one of the most picturesque towns in Spain. Girona is a city I’ve passed through various times while traveling, but I have never been able to spend much quality time there. When I was invited to the town’s presentation of the Temps de Flors Festival, I knew it would mean another day of racing around the city, but I couldn’t resist seeing Girona on a beautiful spring day. 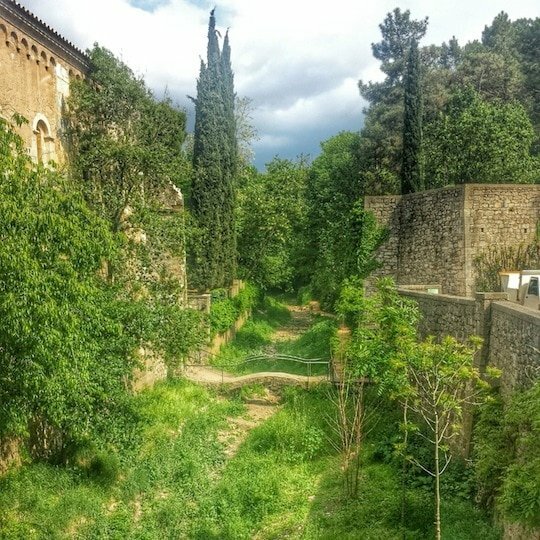 Green Girona at the beginning of May! Girona is definitely one of the most gorgeous small cities I’ve ever visited. I was really surprised to find out it is home to around 100,000 people, as when you’re walking through the old medieval quarter you truly feel like you have gone back in time to a small European village. We traveled to Girona by AVE, Spain’s high speed train, from Madrid. In four hours we had arrived to the city– but not without a few surprises! 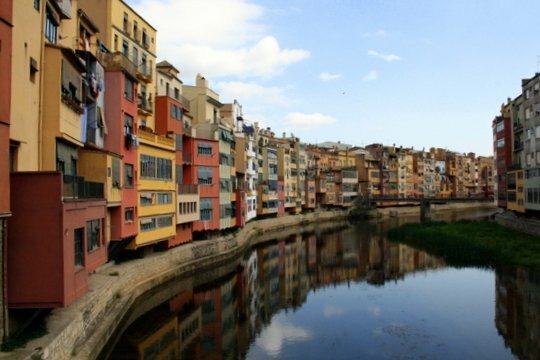 On the trip there, we learned about Girona’s efforts to combat the recession in Spain. Their stance is that tourism is one of the most important industries to protect, and something that won’t be disappearing any time soon. They realize that they have the potential to sell their city in a positive and sustainable way, and that’s what they do. 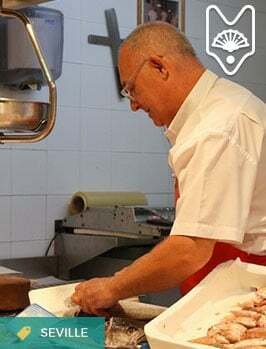 I already knew that the Girona Tourism Board works with travel and food bloggers, and was encouraged to hear that they’ve seen lots of results. They should be an example for other Spanish cities to follow. Live opera on a train? That was a first! 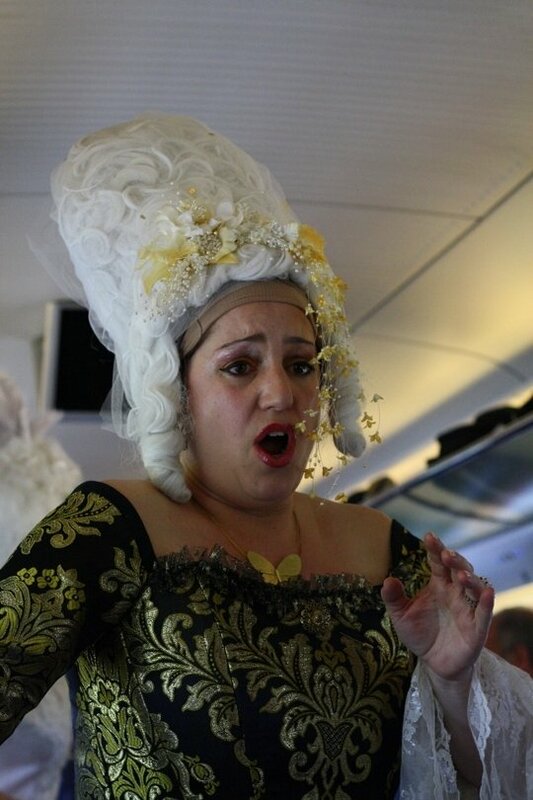 As Girona will soon host the 2014 International A Cappella Festival, we were treated to live opera on the train! 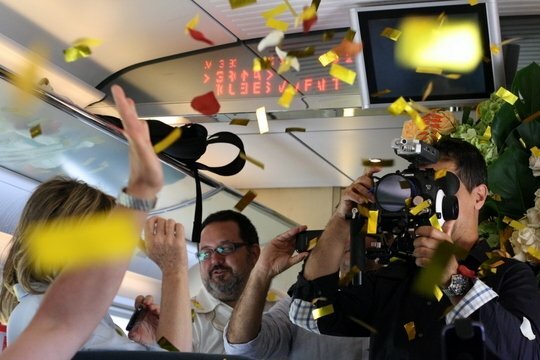 And at the end of the train ride we were covered in flower petals to really set the scene for the day they had planned! 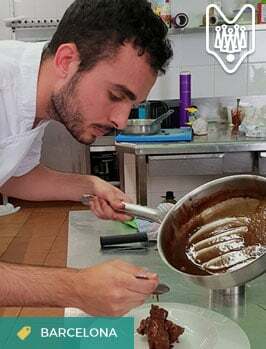 The opera and flower petals were fun, but my favorite part of the train ride was trying a typical Catalan sweet, the xuixo, along with some ratafia (a Catalan liqueur). 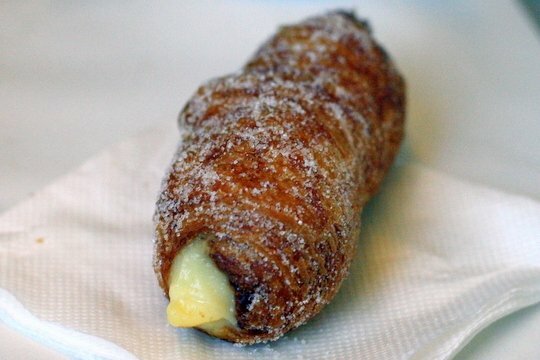 A xuixo is a sort of fried donut stuffed with delicious pastry cream. The American in me was already dreaming up the delicious fillings you could put inside! Legend has it that the xuixo actually has its origin in an untimely sneeze (the sound of a sneeze is more or less how you pronounce xuixo). 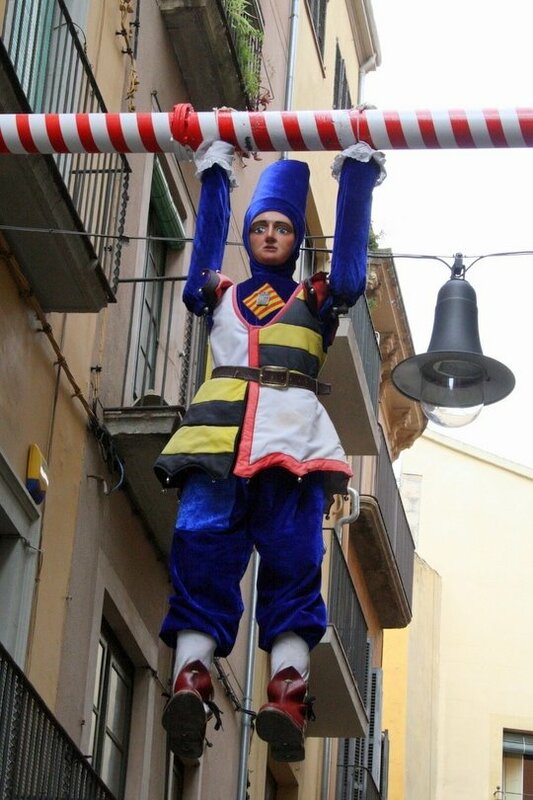 A Girona legend says that Tarlà, the trickster of the town’s folklore, had fallen in love with a baker’s daughter. On one of his secret visits, the girl’s father came home and he had to hide. He jumped into a bag of flour, but couldn’t contain his sneeze, and the father found him. 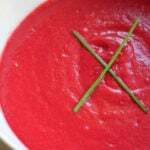 But before he could get angry, Tarlà promised that he’d marry his daughter and also share a very special recipe with him, the xuixo! Tarlà is displayed each year in Girona only during the Temps de Flors, in the same spot in the town center where he supposedly used to entertain the people of the town. We found Tarla in the city center. 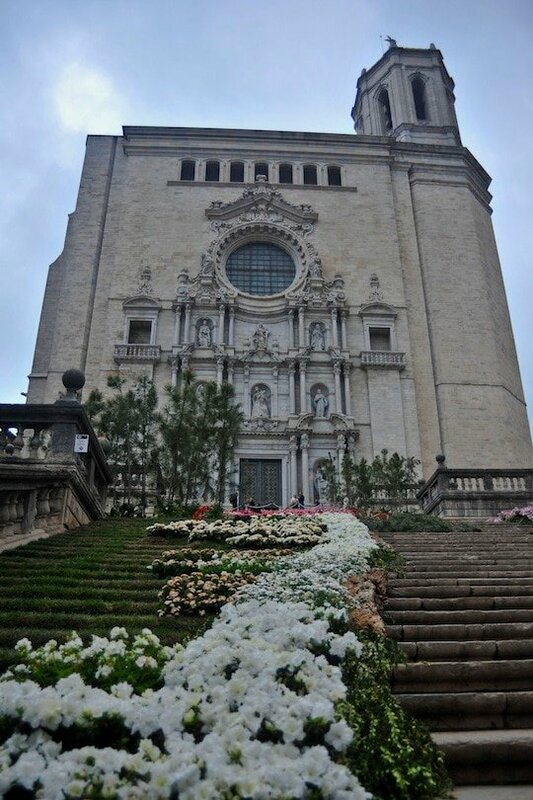 Girona’s first flower exposition was held in 1954 in the municipal theater, and soon after moved to the beautiful Sant Domenec Convent. In 1992 it became a citywide event, and each spring volunteers decorate the city with intricate flower displays. Monuments (like the Cathedral below) are bestowed with gorgeous works of art, and private patios and monuments are also opened to the public for these days only. The 10 day festival draws over 200,000 visitors (go during the week if possible to avoid the crowds!). Visiting Temps de Flors from Madrid is easy and you could even make it a day trip (though I would strongly recommend spending a day or two). Dates: May 10th-18th (2014) Check here for this year’s dates. Start planning for hotels and restaurants! 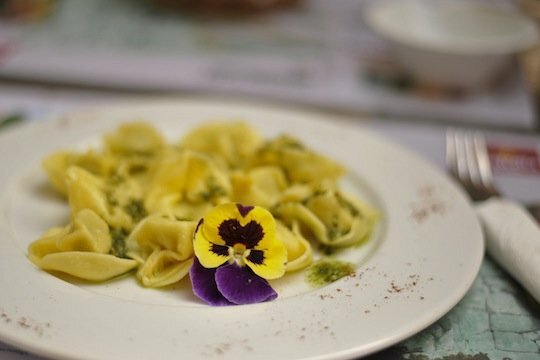 One of the coolest things I learned was that local restaurants in Girona serve special menus during the festival that are centered around edible flowers. I haven’t eaten many flowers in my lifetime, which is what makes me all the more curious to go back and try them. One of the most famous restaurants of all is called La Calendula (marigold in English), where Chef Iolanda Bustos serves up dishes like flower and herb tempura, elderflower donuts, and a craft beer made with hibiscus, marigold, and elderflower. To see the restaurants participating in Gastroflors 2014 click here! Walking around Girona is incredible as it is, and I can’t even imagine how amazing it must be filled with colorful flower displays. The gorgeous Girona Cathedral during Temps de Flors. The old baths of Girona decorated with flowers. Going to Girona to learn about the festival and its history was lots of fun– but it left me with the huge desire to actually go see the festival itself! I would highly recommend spending a few days there this year if possible, it promises to be a great time! 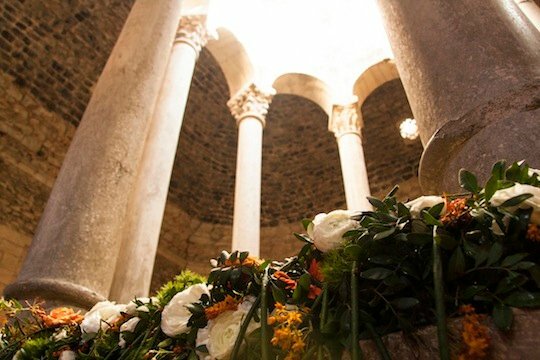 Would you like visiting Temps de Flors in Girona? This looks like a really cool festival, Lauren! I had no idea other parts of Spain besides Córdoba even celebrated flowers on such a huge scale. 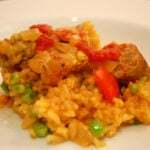 Yet another reason I need to get over there and explore Catalunya outside of Barcelona! I know! I had heard of it but thought it was a lot further away (the AVE is awesome!). I love Girona so I can’t wait to actually go to the festival, hopefully next year! Girona is really gorgeous – I had a seven hour layover in the airport and jumped in a cab to try and see it a few years ago. But when I was there last, the nationalism movement was so in your face, it really detracted from the city and its beauty. Interesting! I was there for TBEX and then had a layover last year and visited for the day with my mom. Apart from the flags hanging, I haven’t noticed the nationalism movement much! I was too focused on eating probably! But it is such a gorgeous place, and the old town is so romantic! 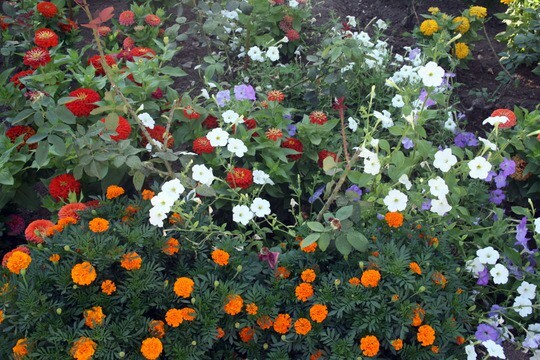 The Temps de Flors is awesome! I went last year and even enjoyed it in the rain – and that’s saying something coming from me. They had some incredibly creative displays. This year, there are going to be some in the city center of Barcelona too, but as it’s only a 40 minute train ride on the AVE I’ll definitely being going to the real thing too. I didn’t know about Gastroflors though! That sounds SO much fun. I’m jealous you’re going! Eat some flowers for me 😉 Next year I’m going to plan things much better and go for a few days if possible. I know! I am soooo curious! I’d love to visit! 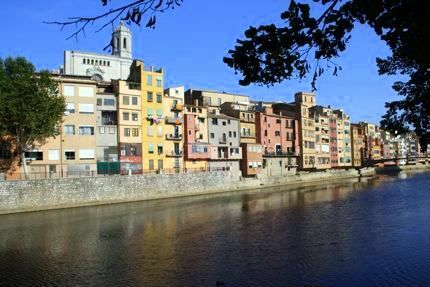 Girona is high on my list of places to go next in Spain, mostly as I’ve heard great things about the food there. This sounds like a beautiful festival, shame I missed it this year! Great that they’re promoting sustainable tourism too.